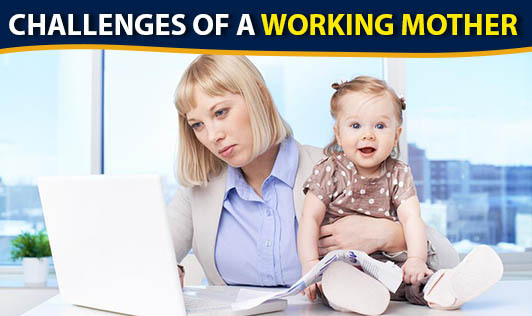 The role of a working mother is very challenging! Striking a perfect balance between family and work means achieving success in fulfilling all her family's needs as well as not neglecting her job responsibilities. When it comes to a working mother, determination, emotional strength and stability are very necessary qualities that she should possess. •Flexible work arrangements to support the various needs. •Health issues: Working mothers are under a lot of stress, and stress-related illness is very common among working mothers. The percentage of working mothers falling ill is higher compared to stay at home mothers. Lack of sleep, work pressure and personal guilt of not being able to spend sufficient time with the children are some factors that causes stress among working mothers. •Logistical problems: This involves coordinating the demands of motherhood and work. She must coordinate childcare pick-up and drop-off, unexpected illness and so on. •Professional development issues: Working mothers often lose opportunities for promotions because of maternity leave. If she works on a part-time schedule, she has to be content with less money and benefits than her full-time counterparts. •Interpersonal issues: Working mothers who don't have much control over their work are most prone to interpersonal concerns. This leaves her emotionally frustrated, and physically exhausted which eventually leads to disturbances and unnecessary quarrels at home. •Prioritize things- Plan, prioritize and complete the things you need to do in order. This will reduce the pressure. •Division and delegation of work- understand your limitations. •Don't hesitate asking for help from your extended family members and friends in time of need. •Take a breather- Stay away from work in the evenings and weekends and spend time with your family. Quality time spent with the ones you love will recharge you energies. "Good parenting is possible only by organizing and prioritizing as much as you can, be open to the possibility that your personal and family dynamics may shift, finally revisit your work-life balance periodically to make sure it still meets your needs"